The Enya 40 XZ with Enya M351X Muffler. The power to weight ratio of this engine is sure to turn heads! While Enya quote a very reasonable ‘useful’ HP of 1.2, if we were test this engine by other manufacturers test methods we would get over 1.4 HP quite easily and probably more! 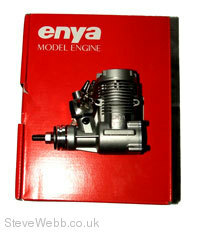 Enya believe in quoting useful power figures and this engine is no exception. Propeller 10 x 12, 11 x 8.5, 11 x 9, 12 x 7.5 and similar sizes. If you are an engine fanatic? - then this is one for you. The usual Enya quality through out. 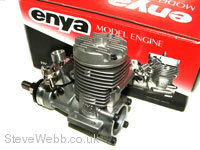 Sure its more expensive than most 40 size engines, but it looks more expensive and it performs more expensive! Another winner from the Enya Manufacturing Co.